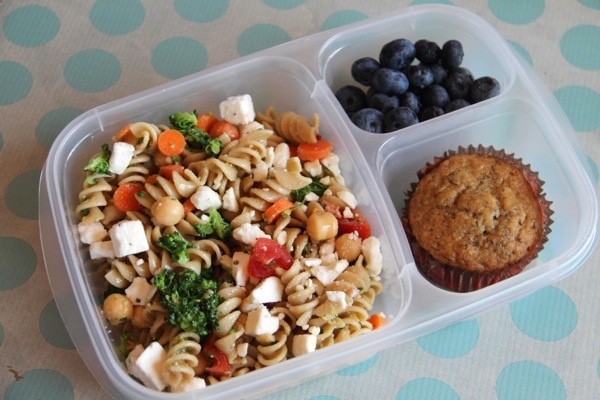 My daughter loves a great pasta salad and is my more adventurous school lunch eater. The boys prefer sandwiches day in and out but she likes to mix it up – hummus and pita chips, leftovers, cottage cheese and fruit, egg salad pitas, tuna salad and pasta salad. 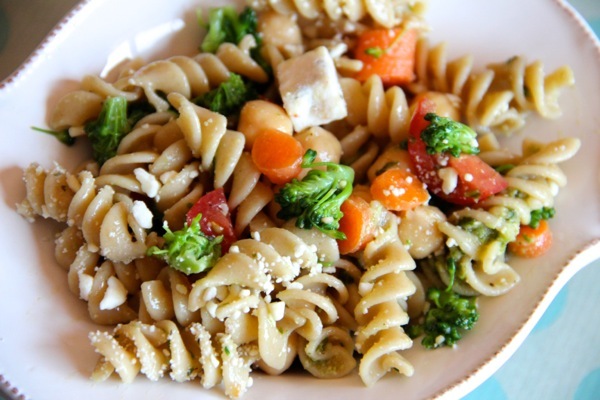 We created this pasta salad a few years ago based on her favorite vegetables and the beauty of a recipe like this is that you can use whatever is on hand or base it on your child’s preferences. You could make it more substantial by adding chicken or even tuna or you could simply add more vegetables. The vinaigrette is delicate but adds just enough flavor especially with the addition of pesto. The flavors do intensify as it sits and it can be enjoyed over a few days. My daughter is not a huge veggie eater but when vegetables are chopped up small and fine she gobbles them right up! A whole grain pasta was used to maximize the nutrition profile of this salad as it is less refined and processed and adds the bran and the germ’s vitamin E, major B vitamins, antioxidants, fiber, protein, and healthy fats. Boil water in a pasta pot and add the pasts cooking until just al dente. Toward the end of the cooking time, add the broccoli florets until slightly tender. Drain the pasta and broccoli and rinse the pasta under cold water. Chop the broccoli in to smaller pieces and add the carrots, beans and cherry tomatoes to the pasta in a large bowl. In a small tupperware container, add the dressing ingredients, seal and shake vigorously. Toss the dressing in the pasta salad and season with salt and pepper. Sprinkle feta cheese on top and serve cold or at room temperature.